An employee of the Mark’s Feed Store restaurant at 11422 Shelbyville Rd. and an employee of Panera restaurant at 1801 Rudy Ln. have been diagnosed with acute hepatitis A. Customers who ate at Mark’s Feed Store from April 13 to April 27, 2018 and customers who ate at Panera from April 12 to April 28 may have been exposed to the hepatitis A virus. While the risk of contracting hepatitis A from having eaten at either of these restaurants is low, the Louisville Metro Department of Public Health and Wellness is issuing this advisory out of an abundance of caution. The hepatitis A outbreak remains centered among the homeless and those who use drugs. When a food service worker is diagnosed with hepatitis A, he or she is immediately excluded from work and not allowed to return without release from his or her medical provider. Additionally, all employees at the establishment are vaccinated and disinfection and sanitation practices are followed. 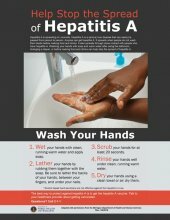 Hepatitis A is usually transmitted by putting something in your mouth such as an object, food or drink, which has been in contact with the feces of an infected person. In November, the Kentucky Department for Public Health declared a statewide hepatitis A outbreak. Since the outbreak began there have been 304 cases diagnosed in Louisville and at least 26,662 vaccinated.